We work in small friendly teams, often with recent graduates, and we require a senior developer to assist in getting the best results from experience in process and technology; you will have the opportunity to make a direct contribution from day one. Our developers must have the ability to analyse, diagnose and solve problems by asking the right questions and using the correct diagnostic techniques, as well as write good code that is readable and maintainable. In addition, it is important that you enjoy working in a team where utilising everyone’s different skills together can create a better result. You take responsibility for the quality of the code you produce, ensuring it’s testable and tested. If you're an advocate of TDD, even better. You can manage large codebases in GitHub and are familiar with branch/merge techniques. You can discuss design patterns, memory management and performance optimisation. You can write code from the ground up with or without frameworks. You have good understanding of API and Microservices architecture principals. You understand Continuous Integration, Delivery and Deployment best practices. You understand SaaS operating model and platforms. You can troubleshoot, debug and update existing product. You will be testing, refactoring and extending the features at the heart of the product. You have experience in leading technical project teams made up of 2 or more Engineers, taking on aspects of estimation, work sizing, Agile project management and planning. You suggest and can execute innovations to improve: our code and technical building blocks; our development processes; our team processes. You are happy to advise the business about new technical developments or specialist subjects in Programming to suggest new tools, methodologies and ideas to make our products and processes better. You enjoy evaluating the technical trade-offs of every decision. You clearly and regularly communicate with management and technical colleagues regarding your own work, estimates and are honest and open about problems or obstacles. Positive energy and enthusiasm - cultural fit is a huge deal for us, we're looking for smart people who are excited about solving big problems and are self-motivated to get things done. You enjoy working closely with others, teaching and learning, and are comfortable showing off your work i.e. code reviews and pair programming. A highly organised and professional attitude to work - You're a great communicator, you are pragmatic, and you know how to build trust. You have experience in Technology companies with good software practices and experience in Agile methodologies. You have minimum 3 years commercial experience in PHP Development with a strong knowledgebase of OOP principles and working Object Orientated development experience. You have knowledge of mySQL. You have knowledge of Laravel or other MVC frameworks. Knowledge or experience in C.I Deployment. We are keen to see your LinkedIn, personal website, GitHub (or equivalent) or any links to work you are proud of. We will be contacting people for the interview process and there will be 3 stages of interviews starting with phone calls. No thanks – definitely no. 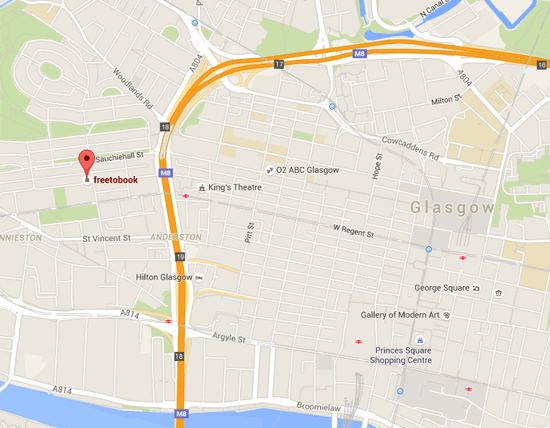 Freetobook is a family run business based in Glasgow city centre. We provide online booking technology to a growing customer base of B&Bs, rentals and small hotels around the world. As we increase development on new products and modernise existing applications we need experienced PHP developers to continue growing our successful online booking system. Be part of an agile and friendly programming team creating solutions for 1000s of independent businesses around the world. Customers choose us because we are open, honest, straightforward and actively support small and medium independent businesses (above all others). Our strength lies in our innovative ability to create new and better ways for small accommodation businesses to thrive online. Many thousands of hotels, hostels and B&Bs all over the world rely on us for their online bookings. There is no better feeling than the positive feedback we receive as we continually roll out enhancements that directly and instantly help their businesses grow. Some of our work involves connecting with the world's giant travel businesses such as TripAdvisor, Expedia and Booking.com, who dominate online bookings. Our technical ability is and has been respected by all of them for years as we continue to develop the best solutions to connect with accommodation owners. The most important thing about you is that you think "yes, this seems like a cool place to be". Our developers enjoy thinking hard to find the right solution for each situation. Always starting with an open mind to find the neatest solution that puts a smile on our customers’ faces and dollar in their back pocket. However, more important than any of the above technologies is a friendly, open and positive attitude to work, learning and life. 2 minutes walk from Charing Cross, Sauchiehall Street, Kelvingrove Park and the West End. Small diverse teams with some very talented minds in the tech industry. 33 days of annual leave inclusive of 8 bank holidays. 10% of your working time allocated to the learning and self-development of your choice. Relaxed dress code and friendly working atmosphere. Food making facilities, games and chill out area. Send your CV to lucy@freetobook.com and feel free to add in any online stuff that we can look at and write a cover note. If you want to discuss this further please just drop us line via the email and we'll get back to you.